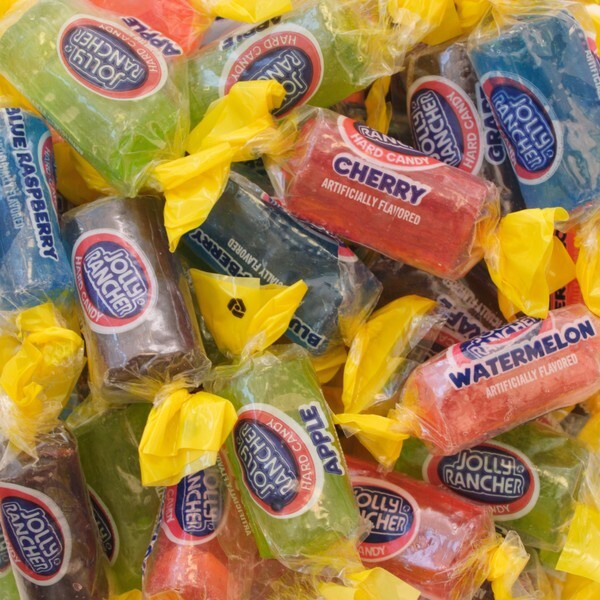 Love Jolly Ranchers? Love lollipops? How about making your own lollipops with your favorite flavors! Perfect for a rainy day and you can make any combination your heart desires! Lay a piece of foil on cookie sheet. cover foil with a piece of parchment paper. Unwrap candies and place side by side on parchment paper in your choice of color & flavor combinations. 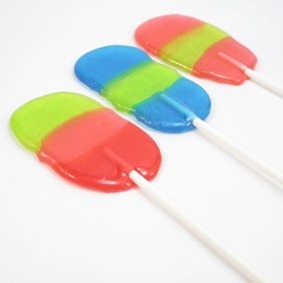 use three candies together for extra large lollies, and only two candies together for regular lollipops. Heat candies in oven for about 5 minutes at 200 ºF. Keep a close eye on the candies and take them out as soon as they’ve barely melted together. If you leave them in too long they will melt too much and you won’t be able to put a stick into the lollipop. Alter the cook time accordingly. Carefully take cookie sheet out of oven. IMMEDIATELY lay candy sticks into place on melted candies. Slowly twirl in melted candy to coat the stick and so it will hold in the lollipop. REMEMBER: they are HOT! Don’t burn yourself but you will have to work fast before the candies harden. Let the lollipops cool about 30 minutes before eating or wrap up in clear cellophane bags, tie with ribbon and give as gifts or party favors! I have already fully admitted that I definitely have a sweet tooth. Cakes, cookies, pies, chocolates oh my! Chocolate by fair is one of my favorites and it was hard to accept that my favorite chocolate bar Twix was off my personal menu because of the cookie bar. But now, most of my favorite chocolates have been taken off my list because most chocolates do contain milk and I recently decided to cut milk out of my diet as well for my health. Recently, I stumbled upon a very sweet surprise. Premium Chocolatiers have Gluten-Free, Dairy-Free, Nut-Free and Egg-Free chocolates! These delights are perfect for gift giving on any special occasion or no occasion at all or just to give yourself a very sweet treat. From Gluten-Free Milkless chocolate covered pretzels (YUM) to delicious truffles, Premium Chocolatiers is definitely bookmark worthy and will keep you smiling all through the year. Color me guilty for having quite a sweet tooth. Especially when it comes to anything chocolate. One of my all time favorite candy bars would have to be Twix. Well I should say WAS Twix because now I cannot enjoy them due to the cookie bar which makes a Twix a Twix. But never fear sweethearts! Our sweets are not lost. We just have to look for them again. The National Foundation for Celiac Awareness (NFCA) put out a Gluten-Free Candy list that has been a wonderful guide for those looking to calm their sweet tooth. 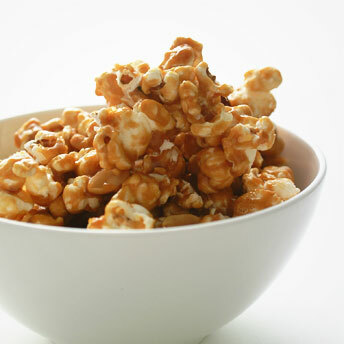 The NFCA does note that “…Gluten-Free Candy List should be used as a guide only. It cannot replace a thorough review of the ingredients listed in order to verifty that any product is in fact, gluten-free” (2010 Gluten-Free Candy List). I was pleasantly surprised while going through this list and found that I can still have many of my favorite treats without compromising anything. Airheads, Swedish Fish, a great variety of Hershey products (my favorite part of the list), Jelly Belly Jelly Beans and more. So although I do miss Twix bars, I know I can still enjoy a sweet treat that is safe for me to eat! Check out the full list and continue to live a sweet life! !